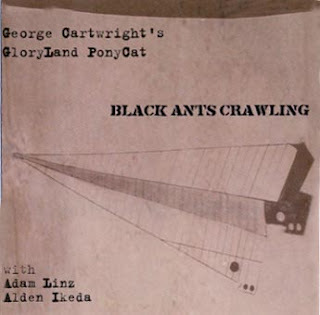 This week's MinnPost piece is on free jazz saxophonist George Cartwright and his trio GloryLand PonyCat. Cartwright, bassist Adam Linz, and Jazz Police publisher Don Berryman all responded to emails I sent while writing the piece. Here are some interesting bits that didn't make it into the article. Question for Adam: "What is it like for you to play with George Cartwright?" Adam: “I have wanted to play with George since I was 16. I heard of him through my ear training teacher Kevin Norton. I was looking for someone to study composition with while I was in New York. Unfortunately George had moved to Memphis. After I moved back to the Twin Cities I heard that George moved here. I got his number and called him and asked him if I could study composition from him. After he heard that I was a bass player he said, 'Just bring your axe and let's just play' We haven't stopped since then. So I get my lessons for free as we play. Playing with George is like playing with one of those jazz greats that you build up in your mind as a kid. You think that maybe one day you'll be good enough to play with them. George is such a nice guy also. Sometimes you meet your heroes and they turn out to be the exact opposite as you hoped for. George is like that funny uncle that says the wrong thing at the right time and makes all the kids laugh." Question for George: "Imagine you're talking with people who haven't heard much free jazz (or any). They have agreed to come to the Cedar show, maybe on a dare. What can you tell them to help prepare? What can they do to really enjoy it?" George: "Everybody has a different reaction to all music. Since we are all individuals we process what we hear on our own personal level(s) and that is what I would stress, that it gives you an experience that you can't get anywhere else and and it is your own to process past the 'how'd you like it?,' 'pretty good' kind of conversation. We've all spent much time and effort to manifest our own single selves through music (hopefully in a positive way) and being able to do that even better in a group (strength of the individual/power of the group kind of thing) and we hope to give that to the listeners also in some form or other. (( ...trying not to get 'mystical' here))." Don summed up the experience of hearing Cartwright by quoting another jazz pioneer: "The late Steve Lacy said: 'The difference between composition and improvisation is that in composition you have all the time you want to decide what to say in fifteen seconds, while in improvisation you have fifteen seconds.' Well, this is a band that nails it in that 15 seconds."